Technically, this impressive species is not a shark but a ray. But as rays are related to sharks, I put the picture in this category. In the Southern hemisphere summer, the guitar sharks can be found in big numbers on Protea Banks, in South Africa. They are called "sand sharks" by the locals. 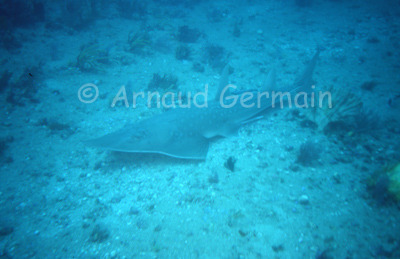 And the best area to see them is a sandy plain, 40m down, called sand shark gulley. These animals are big (Up to 3m) but completely harmless and uite shy.